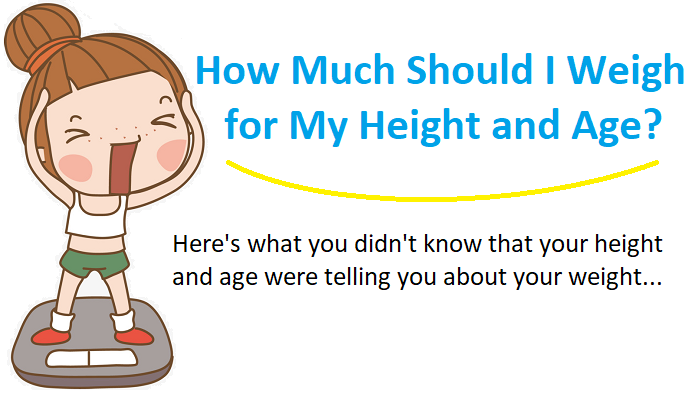 How Much Should I Weigh for My Height and Age? | Diet Happier! Not only is this going to make you more health conscious but it may also surprise you. Whether you are trying to lose weight or create an overall healthier lifestyle for yourself, it’s incredibly important to know your ideal weight according to your height and age. Though there is no exact weight that you should stress over, there are averages that you should definitely take into consideration when trying to figure out how much you should weigh. Keep in mind that everyone is different, one person’s ideal body weight may be completely different than another person’s ideal body weight. ​A couple of great ways to measure you ideal body weight is to measure your ​Body Mass Index, or body fat percentage, using a BMI calculator a​s well as measuring your waist-hip ratio. Using the BMI calculator you will not only give you a better understanding of your height to weight ratio it will also help you understand whether or not you are overweight. Though using the BMI calculator will give you a better understanding of how much you should weigh, it doesn’t take your age into consideration which means it’s not 100% accurate when trying to calculate your age to weight ratio. To get a better understanding of how much you should weigh according to your age, take a look at the height weight chart below. ​Younger age percentiles will have different BMI charts, see boys age 2-20 and girls 2-20 years of age. Before you can get an idea regarding your ideal weight, you should first understand what the Waist-Hip Ratio is, what it means, and what it can tell you about your ideal weight. The waist-hip ratio is used to measure the circumference of your waist in correlation with your hips. In order to calculate your waist-hip ratio, you measure just above your belly button to get the circumference of your waist and measure the widest part of your hips; divide the circumference of your waist by the measurement of your hips. A low waist-hip ratio usually translates into a healthier and more ideal weight. Like I mentioned before, asking “How much should I weigh?” is a great question and an incredibly important one at that. Knowing your ideal weight and being able to compare it to your current weight gives you great insight into your health and presents you with the opportunity to improve it if you need to. Having this kind of insight into your health allows you to set weight loss and diet goals by changing your eating habits and lifestyle.